If you like meringue-type cookies, here’s a recipe to add to your collection. 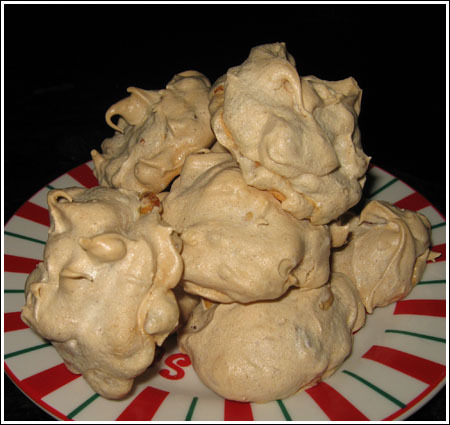 Chewy Chai Meringue Cookies were created by Alison Campbell of Austin. The full recipe makes 24, but you can easily make half if you don’t need so many. After 30 minutes, these cookies will be crispy on the outside and chewy on the inside. If you want them to be a little bit drier, you can turn off the oven after 30 minutes and let them sit there for another 10. I prefer them chewy. They are out of this world when made with macadamias, but I made a batch with pecans this morning and those worked very well too. Preheat oven to 300 degrees and line 2 baking sheets with parchment paper. Sift together powdered sugar, cinnamon, cloves, ginger and cornstarch and set aside. Remove from heat, add cream of tartar and salt and beat with electric mixer until egg whites hold stiff peaks, about 3 minutes. Add vinegar and mix just until incorporated. Gently fold in reserved powdered sugar mixture, white chocolate chips and nuts. Drop by large tablespoonfuls onto parchment-lined baking sheets and bake for 30 minutes. Remove from oven and let cool on a rack. Makes about 24 cookies which are crusty on the outside and chewy in the middle. I’m looking for a plain merinque cookie with a chewy inside, My mother made them at passover and I think she put potatoe startch in them. I’ve tried making them but they turned chewy on the outside as well and they were awful! I’m glad you liked them as much as I did. The chocolate variation is really good too. I made these today and they are wonderful cookies — so delicate, light and only just slightly chewy. It was a perfect day to bake meringues in East Carolina — low humidity inside and out. I was worried that the cloves would overpower, but when baked up the flavors are mild and exotic. However, I didn’t want to go to the trouble of warming the egg whites. Instead of buying expensive superfine sugar, I made my own in the food processor and mixed these the traditional way (see judyskitchen.blogspot.com for details.) I absolutely love these and will make them again and again. They are something different on my Christmas cookie tray. The next time I will put them in a pastry bag with a star tube to make them prettier. Thank you for posting the recipe! I just happen to have a bag of those Andes peppermint crunches you mentioned. I haven’t tried them in the meringues, but I am almost positive they’d work. Has anyone try using the pepperment crunches (Andes) or the caramel bits (krafts) in these merengue cookies? I was looking for a chewy chocolate merengue cookie and came across this site. I too want to try with chocolate instead of the cinnamon, cloves and ginger. Has anyone tried this? Kristin, I hope you are over the peppermint meringue incident. Dana and Miya, I ran out of egg white and didn’t re-stock until this evening. I’m going to try the chocolate ones tomorrow. I might also try using crushed up Butterfingers. Krista, I think vinegar can get kind of bad. Anne, how did the chocolate ones turn out? I like the idea of white chocolate and peppermint especially for the holidays. YUM! These look interesting. My mom used to make a mint meringue cookie at Christmas that had mini chocolate chips in them (it was a pretty green cookie). I’m going to make those this Christmas–hope my kids like them as much as I did! Miya, you and I are thinking along the same line. In fact, today I want to make another batch with chocolate. I’m going to cut out all the spices, add a little vanilla, a little unsweetened cocoa powder and use chocolate chips. Peppermint mixed with the white chocolate chips would be a great combo. These really ARE just incredible cookies! These look really good! I have been looking for a Meringue type of cookie. Have you tried adding other flavors to these? Like peppermint? I am sooooooooooooooooo making these this week! !